Hilton Rose Hall Resort and Spa is an all-inclusive, family-friendly resort nestled between the scenic mountains and turquoise Caribbean waters of Jamaica and is a winner of the TripAdvisor 2018 Travelers' Choice, an award given to the top 1% of all hotels on TripAdvisor. The contemporary, beachfront accommodations set on the legendary 18th-century Rose Hall Plantation evoke the colorful charm and hospitality of the island. Guests can select from an assortment of distinctive on-site amenities and dining venues as well as endless recreational options and an exuberant nightlife; the plethora of activities lead way to creating an exciting atmosphere in a stunning tropical setting. 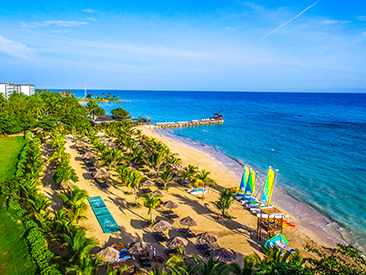 Nestled between the scenic mountains and turquoise Caribbean waters of Jamaica's north shore, the all-inclusive Hilton Rose Hall Resort & Spa inhabits an enviable oceanfront location on the edge of Montego Bay. The contemporary beachfront accommodations, set on the legendary 18th-century Rose Hall Plantation, evoke the colorful charm and hospitality of the island and all feature a private balcony or terrace. 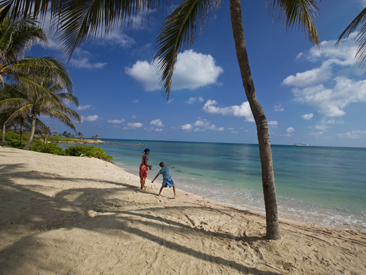 As an exclusively all-inclusive property, the resort offers guests of all ages an increased level of comfort and convenience, complemented by a friendly and professional staff. Guests can select from an assortment of distinctive on-site amenities and dining venues as well as endless recreation options and an exuberant nightlife with different entertainment on tap each evening. This Caribbean haven exudes an unforgettable ambiance in a stunning tropical setting. In addition to its ideal north shore beachfront location, Hilton Rose Hall is conveniently located along the Rose Hall main road — only 7 miles west of the city of Montego Bay with its "hip strip" and a quick 15 minute ride from the Sangster International Airport (MBJ). Families, couples, and kids will love floating down the lazy river at the hotel's Sugar Mill Falls Water Park (one of the largest and most exhilarating water complexes in the Caribbean). Navigate through cascading waterfalls to experience the thrill of a 280 ft. slide, relax along the lagoons, or refresh with a refreshing drink at the swim-up bar or poolside cabana. In addition to the amazing water park, this family-friendly, all-inclusive Jamaica resort offers superb food and beverage overseen by an award-winning chef. Choose among five all-inclusive restaurants, snack bars and grills offering casual alfresco dining, Jamaican favorites and exceptional northern Italian cuisine, all with a children's menu available. Play a round of golf at the par-72 on-site championship Cinnamon Hill Golf Course or enjoy a game of tennis at the outstanding tennis center. Celebrate a special occasion in the resort’s 44,000 square feet of combined indoor and outdoor meeting and event space accommodating up to 800 guests. Host an elegant wedding at a unique outdoor ceremony site, such as the ancient aqueducts. New Renovations: Hilton Rose Hall Resort & Spa recently completed a multi-million dollar renovation on their property. 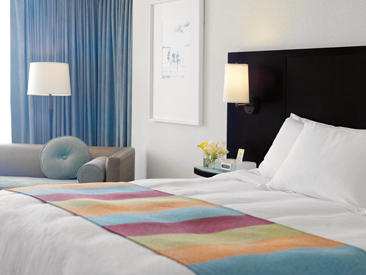 The renovations emcompassed additional dining including a Pizzeria and Italian Kitchen and bars, expanded beach area with cabanas, a stylish and inviting entrance to enhance guests arrival experience and guestrooms will now feature 48" flat-screen TVs. Bookings made after November 21, 2018 will no longer include transfers, Nexus transfers can be added to your booking. Please note, that bookings made prior to November 21, 2018 will be upheld with the transfer included in the booking price.